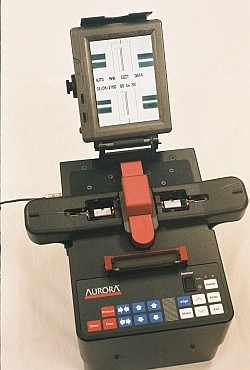 Aurora Optics has revolutionized the field of polarization-maintaining fiber splicing with a new way of identifying the fibers’ fast and slow axes. Any standard PM fibers can be measured and rotationally aligned, even elliptical core, without end launch or detection: Panda, PureMode, TruePhase, HiBi (“Bowtie”), Tiger, and E-core. In addition, the Fusion 4000 combines both fiber technologies for x-y-z alignment, Profile Alignment System (PAS) and Local Injection/Detection (LID) for the ultimate in splicing versatility. Aurora’s nanoscale piezo positioners allow core-to-core alignments on all standard fibers, not just SMF but also Er-doped, pm, NZ-DS, LEAF, and even multi-mode. And all can be controlled by an external computer when desired, for factory efficiency, datalogging, or more. SMF, depressed clad, DSF, NZ-DS, DCF, LEAF, bend-resistant, high-strength, etc.